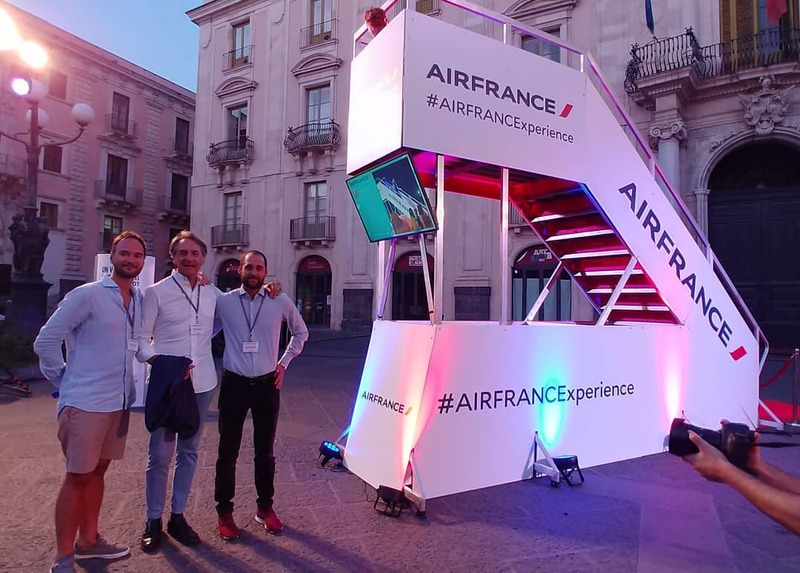 Air France contracted our service as an essential complement during the events which took place in Italy last summer 2018. Our main goal was to help them to boost their engagement with current and new customers. By harnessing the power of user generated content on social media, we provided dynamism to the events. 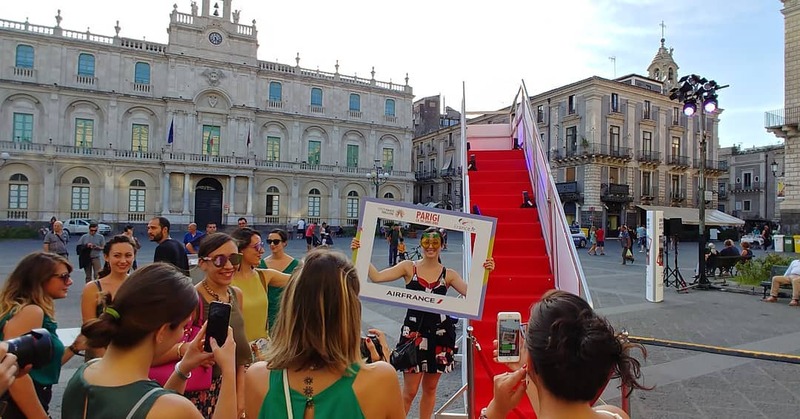 The French airline organized several events along Italy with the purpose of reaching new clients in the country. Some of the events were established in cities like Bari, Catania, Barberino, Treviso and Reggio Emilia. All the venues followed a similar pattern, but we will focus on the Catania event and how it developed. The event took place in Piazza Università, located in Catania’s old town, Italy. It is considered one of the most emblematic places in the city due to its nearness to the cathedral. The whole square has historical and cultural value because there you can find the first University founded in Sicily (in 1696). Apart from the historical value, the square is a great location, frequented by many people during the day. For that reason, Air France chose this scenario as their meeting point. The event included numerous activities and shows inspired in France, dedicated to children and adults. On the one hand, they hired professional dancers to perform a cancan show in the middle of the setting. The “cancan mademoiselles” wore colorful dresses in order to attract the attention of people. It was a clear reference to the most popular cabaret in Paris: the Moulin Rouge. On the other hand, they encouraged people to participate in team paper airline contests and other activities such as live magician tricks and French fashion shows. Last but not least, they recreated the neighborhood of Montmartre by hiring some artist to draw portraits of the attendees. Regarding the catering, they offered all sorts of beverages and food inspired by French cuisine, and that made more and more curious to come. The company created a fully integrated social wall that suited their needs. The pricing modality they chose for the events was our “professional plan”. As you might know, the professional solution includes a customization feature. 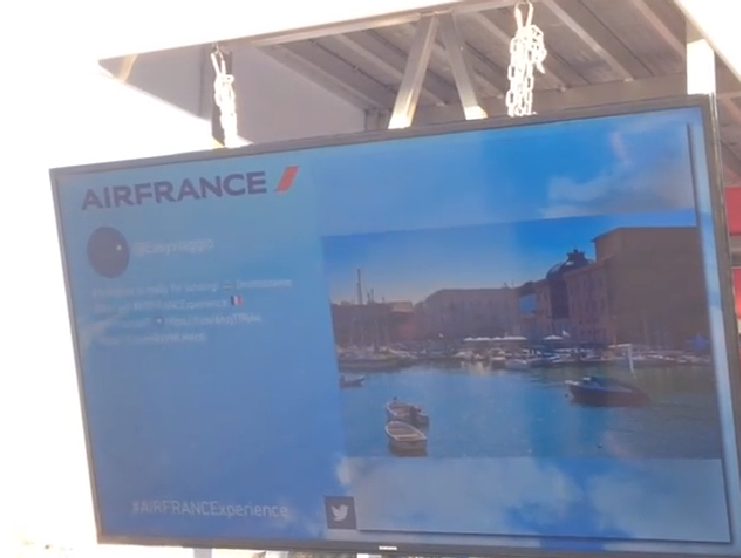 Air France created a fully integrated social wall according to their needs and adapted the slideshow to their corporate image. For the background color of the presentation they chose light blue according to their brand style. Also, the company inserted their own logo in the presentation instead of Hashslider’s, which is set by default. Regarding the hashtag, they picked out #AIRFRANCExperience. To collect more posts, they spread it all over the meeting point so that new people could participate too. There exist some useful tools which help to make participation grow exponentially. The most popular ones are photocalls and photo booths because they engage the audience no matter how old they are. Air France not only brought those supplies already mentioned, they also had spectacular scenery set in the airline world. We could say that the only missing thing were the aircraft! They brought to the event stairs representing the ones used to access the planes from the airport runway. At the same time, stairs were used as a screen support and, thanks to that, Hashslider social wall could be configured. Attendees loved to go upstairs to take some pictures and share them real-time on social media. 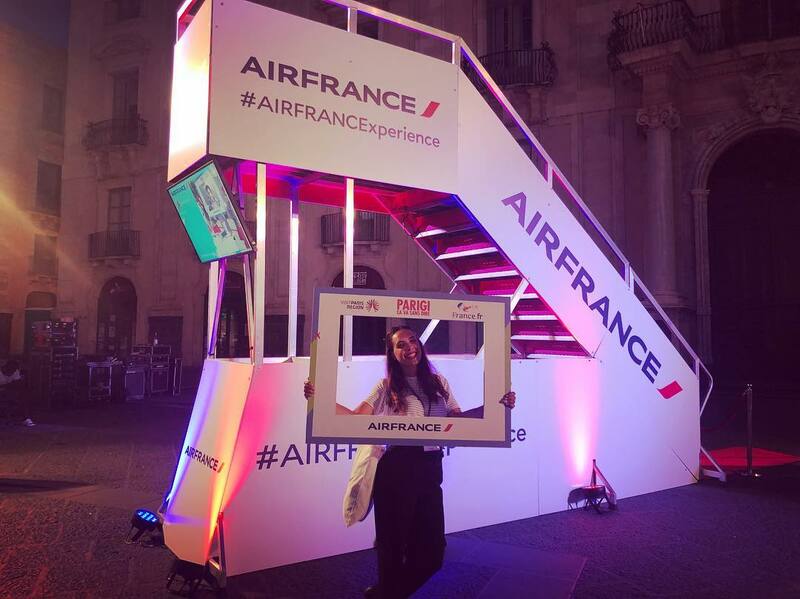 Air France recognized the potential benefits of leveraging user generated content as part of the several events they organized. The team wanted people to broadcast how much fun they spent at their events, so that everyone who watched the posts on social media would relate the brand to positive vibes. 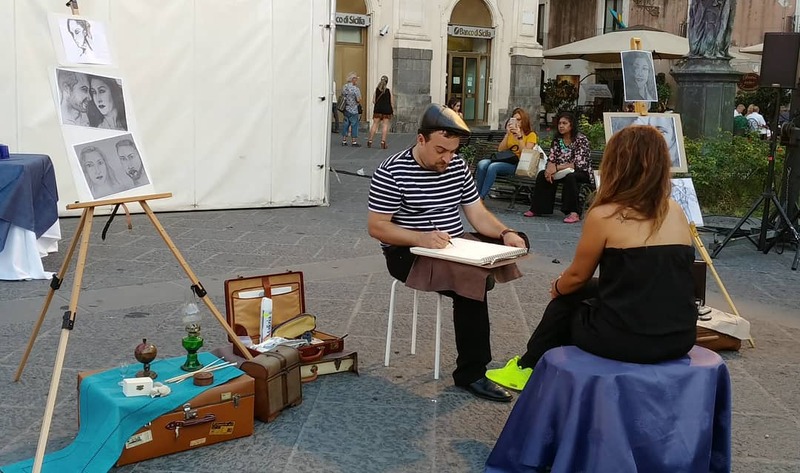 The challenge was not only to generate brand awareness, but also attract new customers and reinforce the brand perception over the Italian population. They wanted to increase interaction between people, the screen and the brand. Undoubtedly, we helped them to gain extra exposure by supplying our professional solution. 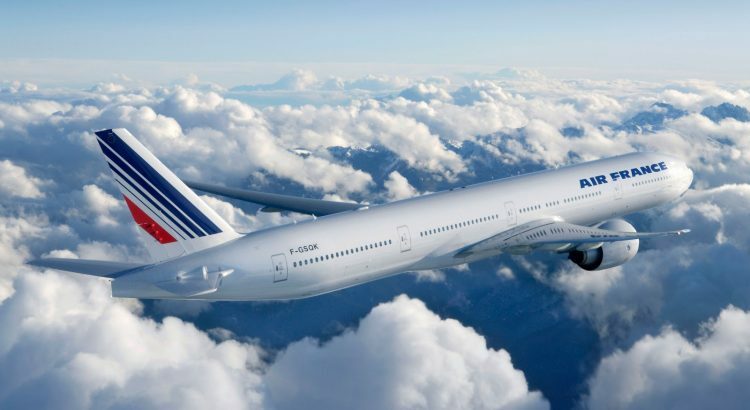 Hashslider gave Air France the opportunity to engage their community. Consequently, they achieved their main purpose: obtaining new customer information in the database. Throughout the events, Hashslider managed to provide a great social wall were the best experiences of the attendees were shared and, as a result, the “call effect” made the celebration be unique and such a success.